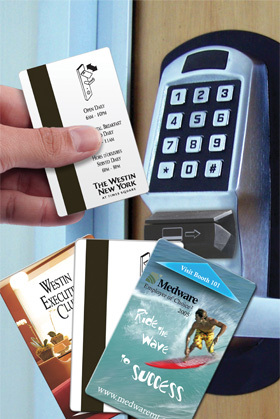 Access Cards with Magnetic Stripes are used not only for hotels, but businesses, buildings, event management, college/university dorms, etc. weight: .030 White Plastic | size: 2-1/8" x 3-3/8"
Also available as (1-3/4" x 3-1/2") Call factory for pricing. Choose from 300 or 600 oer magnetic stripe. For Hi-Co Mag. Stripe add: .08(p). Setup Charge: 1/1 up to 4/4 $50(v). Ad Copy Area: 1-7/8" x 3-1/8"
Production: 10 working days from proof approval. For Rush Options, see page 2.